Microsoft is getting ready to absorb its Outlook.com into Office 365 by updating the technology behind the web-based email offering. First reported by The Verge, Microsoft will migrate all Outlook.com users over to Office 365 later on this year and the web-based email service will adopt a user interface and feature set that is identical to Office 365's Outlook Web Access. As far as branding is concerned, the Outlook.com name is on track to remain in place for consumers, however, the Office 365 technology will help power it as a separate free email service that lacks any of the other Office 365 benefits. Maintaining a uniformity across Outlook, Exchange and Office 365 platforms is the key driver behind the changes and Rob Lefferts, Microsoft's general manager of Office Apps, speculated last week that "there will be some visual enhancements" as part of the move. 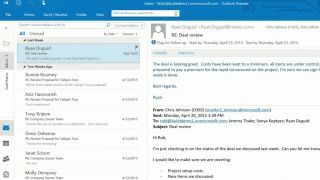 Outlook.com remains a big part of Microsoft's plans and at last week's Build conference it announced a number of new partnerships with external companies to create addons. This includes Uber bookings, Boomerang email scheduling and the promise of many more partnerships using Outlook APIs. Office 365 will form a big part of Windows 10 and it currently costs just £5.99 ($6.99/AU$9.00) per month to gain access to full versions of Word, PowerPoint, Excel, OneNote and Outlook on one PC, one smartphone and one tablet with a small price hike to extend it to up to five of each device.